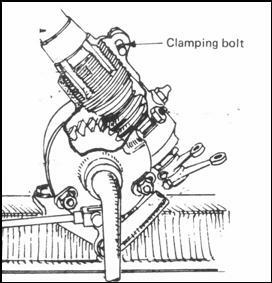 This article will give you a few tips on how to take most of the wear out of your steering box. It only relates to the earlier box use on a majority of Austin Sevens up to approximately mid 1936 when the box design was changed. Having put the car up on axle stands at the front, the higher the better, and removed the front offside wheel, the first thing you need to do is remove the steering box and column from the car. To do this you need to remove the steering wheel, having disconnected the ignition and gas levers first. You must also remove the drag link between the box and the front axle, this is best done by detaching both ends of the rod to give you maximum space. Then you need to undo the fixing bolts of the box to the chassis including the brake pedal pivot stud. Finally undo the steering column support bracket at the bottom edge of the dash. You should now be able to lower the box and thread the column downwards through the floor pan and under the car. The earlier box used a worm and pinion device to operate the arm and this may be subject to wear in its central position, that is when the car wheels would be straight ahead. 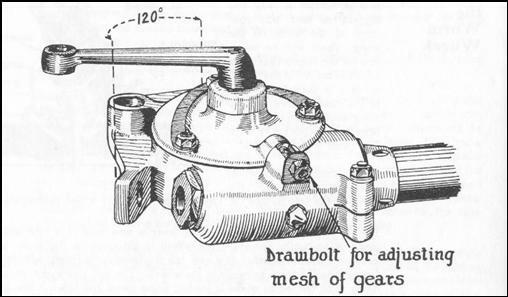 Austin designed the pinion with three keyway slots so that the worm could be reposition on the shaft and an unused portion of the gear now brought into use. The gear in normal use only swings through a relatively small arc and therefore most of it is unused. You will need a strong press to get this gear off of the taper shaft. However, moving the gear round does not effect any wear apparent in the worm gear in the box. As I didn’t have a press to hand I decided to take the longer route by using grinding paste to remove high spots on the pinion so effectively it ended up all worn to the same degree. I am getting ahead of myself so I will back track a little. The side plate of the steering box is adjustable to move the worm and pinion in and out of mesh. In a worn box you will find that if you adjust the box so that there is little backlash in the central position the steering will lock up when the wheel is turned away from straight ahead. This is what we need to remove. Before you take the box apart check for any movement of the steering arm in and out of the box along the axis of the shaft, there is a hard steel button inside the box which takes up this play but is adjusted by shims from inside. If you have no play in this direction then you will not need to disturb the button, otherwise when you strip the box down you will have to remove the button and add more shims. You now need to totally strip down the box. The column is removed by undoing the pinch bolt on the top of the box and remove the locking peg on the side of the box, you should now be able to unscrew the column using a ‘C’ spanner in the notches at the base of the column. Note and felt bushes that come out with the column, there is a bush at the top. Having slid the outer off you will, no doubt, be presented with a black greasy shaft. Be careful of this grease it stains like mad! You should now be able to remove the shaft and worm by rotating the shaft and winding the worm out past the pinion. Now remove the side plate on the box. I found petrol to be the best cleaning agent for all the grease, remove most with rags then soak in a petrol bath and use a brush to get out all traces. You will nee to get the inside spotless to be able to carry out all the adjustments. If you need to remove the little button this is done by drifting into the box from the outside. If you look at the box casting you will see an indent opposite where the steering shaft came out of the box, this is the end of the button. Be very careful to note the shims that will be in there already. I needed to add approximately 20 thou to my box, I had some shim material so I carefully cut one out. The safest way to do this is to clamp the thin sheet material between two pieces of flat hard wood or scrap metal. Now drill a whole through this sandwich so that the peg on the button will fit. When you unclamp the sandwich you will have a clean hole in the thin sheet. Now trim the outside down to the outer diameter of the button and he-presto ! one shim. If you do not have any shim steel available then a softer material like brass will do, this is available from model shops. You may need to make a selection of shims to get the best adjustment so sandwich a few layers when you drill the hole and you will have a few to play with. Put your new shim into the recess first, then the existing shims the button, Now bolt up the side plate and check for play, there should be free movement of the shaft and just perceptible in out movement. You may need to repeat the process, taking out or putting in more shims, until satisfactory play and movement is achieved. Now is the time to get this right as the only way you can adjust this is when the box is apart. Now the laborious bit. I can not claim any credit for this method, it is in the green ‘Companion Book’ which should be on every Austin Seven owner’s shelf. Dry assemble the box having smeared a LITTLE valve grinding paste on the worm. Adjust up the side plate so that the steering arm will just become tight when it is at the extremity of the arc, I went a little past the normal arc of operation to ensure I had the best end result. Rotate the steering wheel shaft backwards and forwards until the tightness at the ends has gone, then adjust the side plate a small amount until tightness is again felt at the extremities of the arc. And repeat the rotation of the steering wheel shaft until the tight spots are free. Keep repeating this process until, when the side plate is adjusted tightness is felt throughout the whole range of the arc of operation of the steering arm. You will be relieved to know now is the time to stop! I clamped my column in a ‘workmate’ so that the column was horizontal in the jaws and loosely fitted the steering wheel and used this to rotate the shaft. Warning! It takes a long time and is very boring! However the end result is well worth it. Having achieved the best you are going to get you must now clean the insides of the box to remove all traces of grinding paste. Again clean petrol is best here. Assembly of the box is a simple reversal of the dismantling. To adjust up the box, you should already have adjust to side float with the button. Next you should adjust the up/down of the steering column by screwing the column into the box until there is no up/down movement but the shaft turns smoothly. Finally put the side cover with pinion gear onto the box and adjust the mesh between the worm and pinion until there is free movement throughout the arc of operation but little or no movement of the steering arm backwards and forwards. All simple stuff, and cheap! and the end result well worth it. Don’t forget to put new grease in the box! This article, written by Malcolm Watts, originally appeared in CA7C Seven Focus in Apr 2008 pp22-24.